Kimberly-Clark Professional (KCP) has a bold vision for creating a “5 star rated” end-to-end, holistic customer experience to drive powerful customer connections and business growth. Executing this vision requires flawless customer data and world-class analytical capabilities, and the Global Analytics and Data Quality Manager is at the center of this effort. The Analytics and Data Quality Manager’s two primary responsibilities are: (1) creating and executing the global vision and framework for KCP’s data quality program and (2) managing and actively participating in the development of key global analytical solutions to transform data into business insights. With respect to the development of analytical capabilities (30%): this person will engage with key stakeholders to develop and agree to medium- and long-term strategic plans and capability development roadmaps, ensuring alignment with KCP objectives and leadership vision. The incumbent will act as a trusted business advisor providing oversight to enable successful delivery of key programs and special projects, while creating demand for new ideas and concepts. This role is accountable for rapidly deploying reporting & visualization on existing data sets and for building capabilities that will provide KCP with a competitive edge around analytics. The incumbent will become an expert at selling and demonstrating the “art of possible” with analytics, and will evangelize the need for information-based decision making. This person will work with local teams to modify/improve existing reporting, and quickly create new reporting as needed, while influencing the requirements and development of the KCP data lake. In regards to data management (70%): This position will lead critical initiatives and projects in the areas of managing and executing data migration projects, master data management, data clean up, and data governance and quality projects. This person is responsible for creating data integrity standards and guidelines; conducting data integrity gap assessments of current-state practices, procedures, and system functionality; and developing and providing data integrity compliance plans as needed. The right person for this role is proactive with stakeholders, a self-starter who can work under broad direction, and passionate about storytelling with data. An entrepreneurial mindset and approach to leading programs and projects, with strong executive presence and ability to influence customer expectations. Can effectively navigate conflict between multiple business constituents and appropriately balance risk with business value. Act as a trusted advisor for business partners to deliver analytical solutions with hands-on data blending and reporting/visualization skills. Deliver innovative, efficient and cost-effective solutions to meet enterprise needs and to drive business growth and profitability. Drive opportunities to reuse the same reporting environment across multiple use cases. 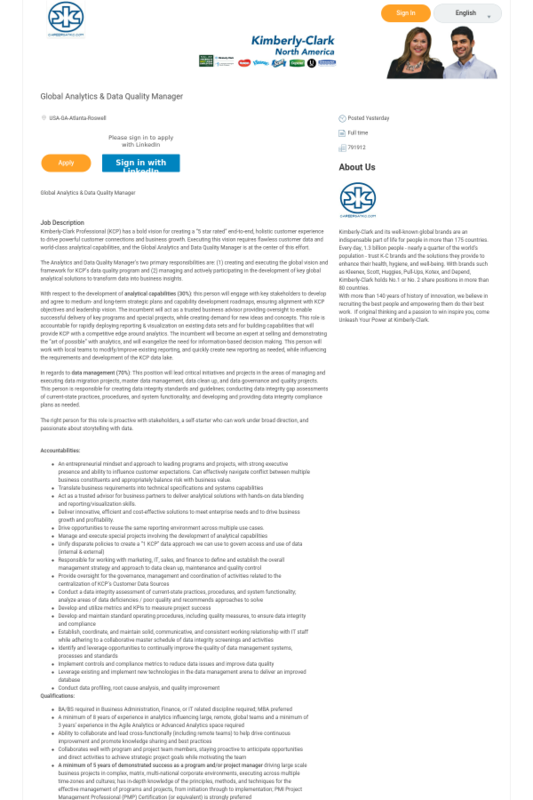 Experience with Alteryx or similar tool preferred. Experience in a B2B environment preferred. K-C will support in-country relocation for the chosen candidate for the role, including assistance to obtain proper work authorization. The benefits provided will be per the terms of K-C’s applicable mobility policies. The benefits/policy provided will decided in K-C’s sole discretion.